Changes in diet and lifestyle have a minimal impact on around two thirds of all cancer types, according to research in the United States. 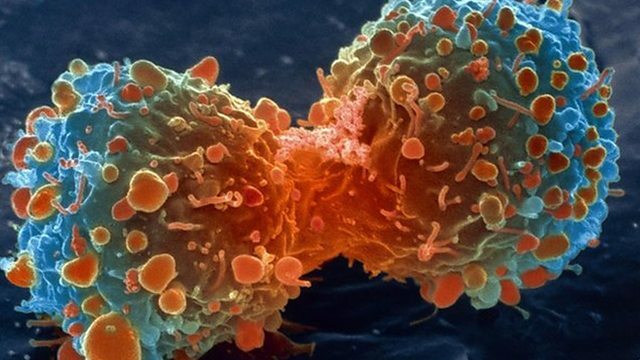 Bert Vogelstein and Christian Tomasetti, from John Hopkins University, analysed 31 different cancers and, writing in the journal Science this week, they say most of them are caused by chance cell mutations rather than any external factors. Dr Tomasetti told Today's Mishal Husain: "Every single cancer is going to be the result of all three factors: chance, environment, and hereditary." "There are some tissues, for example bone cancer, where there is very little evidence of any important hereditary or environmental factors." "We need to focus, even more than before, on secondary prevention. Which is basically early protection." First broadcast Today programme 2 January 2015.